Current Australian engineering curriculum focuses strongly on engineering science and is typically technically based and content driven. Often insufficient emphasis is placed on relating content to current industry practice and generic skills. Courses taught with many practical examples drawn from real life or incorporate industry practice better prepare students for situations that they have not previously experienced. Theoretically bias courses are often taught at speed, without providing students with time to assimilate the material. 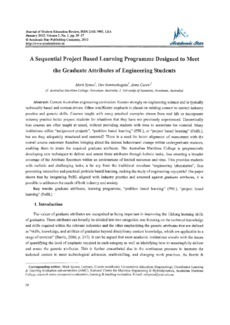 Many institutions utilize "assignment projects", "problem based learning" (PBL), or "project based learning" (PoBL), but are they adequately structured and assessed? There is a need for better alignment of assessment with the overall course outcomes therefore bringing about the desired behavioural change within undergraduate students, enabling them to attain the required graduate attributes. The Australian Maritime College is progressively developing new techniques to deliver and assess these attributes through holistic tasks, thus ensuring a broader coverage of the Attribute Spectrum within an environment of limited resources and time. This provides students with realistic and challenging tasks, a far cry from the traditional mundane "engineering laboratories", thus promoting interactive and practical problem based learning, making the study of engineering enjoyable! The paper show that by integrating PoBL aligned with industry practice and assessed against graduate attributes, it is possible to address the needs of both industry and society.